It is interesting how viral videos are making a huge presence in the business world and everyday life. People are creating videos for entertainment and educational purposes, and getting millions of views from it. Just the other week, i bought a cell phone case that was difficult to put on my phone, and it didnt come with directions, so i youtubed it and within seconds found a directional video of installing the case. I think this video was created to be viewed as an artistic work piece and potentially to promote biking as an alternative to driving, It did mention in the article or at the end of the video that the creator made this video for his father who got him interested in biking. So i think maybe it had a couple meanings to the author. If it was meant to promote biking, it did not do the trick in my book. This is the message I got: it is ridiculous to try to live on a bike. At some point you have to utilize camera magic or stop pedaling. Sounds to me like this was an artistic montage to his father by basically illustrating what you tend to give up with that much dedication to something like mass amounts of bicycling. If anything, I think this is meant to spotlight those who do long distance bicycling and illustrate the basic things we forget about that are incorporated into our everyday lives. I think that the creator was not only doing it for his father, but also to show that what people tend to do in their car can also be done on a bike. I think that in a way he was showing that people do too many things at once when they should be focusing on one thing at a time. I actually found the video to be funny and eye opening in that people try to do too much because of this need to save time. In the video he pretty much does stuff that we all do, but because it’s on a bike we think it’s just for entertainment and not to be taken seriously. In a way he was probably trying to be funny and based on the ending I can see that all involved did have fun, but I think that it would be unfair to say that he didn’t have any other intention behind it or that he didn’t have another message he wanted to convey. I can see the power of one video clip that can reach a wide range of people to influence them, however, I found this video more entertaining than educational or influential. I interpreted the purpose of this video to demonstrate how life would have looked like if we continue our daily life task on a bike, yes, maybe the video was not realistic, but that does not mean it did not get its message across to its audience. At least, it enabled me to envision such an outside-of-the-box thinking. some videos are created just to “go viral” and I think this is one of them. I think the creator was like, “do you know how many views I would get on Youtube if I did a bunch of weird stuff on my bike?” I do have to say this video was entertaining and creative but I am having a hard time figuring out why exactly it was made. In the end I’m sure the guy made a little extra cash from Youtube. I agree with Noah here, aside from the dedication of the video to his father, I can’t really tell why this was made. Michaela has a point though, perhaps he was trying to call attention to the fact that you can do everything on a bike that you do in your car. Maybe that’s why he dressed up as different characters at one point? I didn’t understand that at all. Regardless, no one (other than this guy) would want to do some of these things on a bike, so what was the point of doing them? I think this video shows a unique art work, where someone can promote his biking as an alternative to driving. I can seriously see how this video can actually influence a lot of people, but truly I found this video very entertaining to watch. 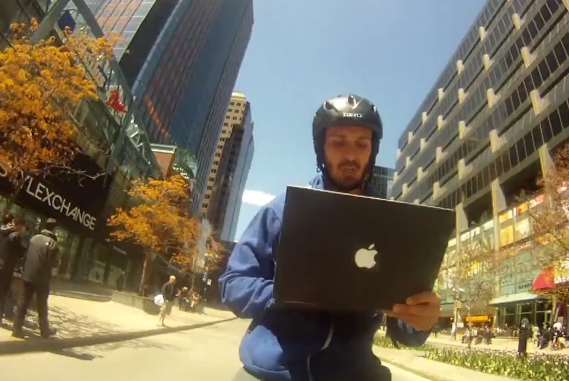 In a unique way I think it’s really funny video, and keeps your eye opening to watch someone on bike using his computer. I think this video was taped for an entertaining purpose. The man did everything on his bike like what we do in our daily life. I think this video is an artistic piece work based on its unrealistically activities. Such as he can cook egg with no heat, he can sleep, and he can talk on the phone without watching the road. In think the man was inspired by his father‘s love story, so he decided to ride on his bike for many days to see if he can find his true love like his father. I think the purpose of this video is to exhibit passion and resistance. The more you resist, the more you can go through. It is so hard to go through all the difficult times. Once you can overcome the obstacles, finally, you will reach your goal (he met his girlfriend at the end). After watching the video, the first thought that comes to my mind is entertainment. I am not sure what the producer’s main purpose or intention to make this video. At the beginning of the film, it said it is dedicated to his farther who is a biking enthusiast. Other guesses in my minds are to promote bicycling, to promote a sustainable lifestyle, or it is just artistic behavior. Personally, I just don’t feel the educational intention is strongly showed in the video, instead, it makes me feel more like an entertaining video. I think what the man did in the video is creative and makes people to have certain thoughts, but it doesn’t seem possible that a person could do everything on a bike for 382 days. I think this video could get a lot of publicity because it shows something that not commonly happen in our real life. Indeed viral videos have a way of spreading like wild fire. A video gets produced then shared with friends who then share it with their friends and on and on the cycle goes. BUT….. what is the impact or what is the goal of such videos. Sure some people just want the bragging rights of 500,000 views and growing, or the chance to make some quick internet cash, there are also those who just want to share their creativity to inspire. These videos are forgotten just as easily as they are found and shared. I believe, we as an internet society are slowly refining and evolving our use of social media outlets like you tube and vimeo. The video itself though creative is lacking in plot and message. GREAT we see a guy spending a year on a bike but what is the point. If he was biking for a purpose the video would have a greater tug at the heart. I thought this video was entertaining. It doesn’t necessarily have to have a point, I think the guy just made it for fun (look not everyone can ride on a bike handsfree holding a pan with breakfast). It makes me think of the the things I do if I’m in a hurry and need to do everything at once………. This video is great idea of showing the creativity of presenting the product, also this video’s main goal was that to reach a high number of viewers where people in the future will have to remember this video and open again and share with other friends to gain more numbers. In conclusion, it is good to know that putting a video on YouTube will help people view it all around the globe, however it is hard to manage people responses to these videos. Most importantly, we have to keep in mind that any video that we publish to the public has be respecting others and deliver the main point. This is definitely a creative video and entertaining to watch. I am amazed at how quick a video can go viral and how much influence or popularity it can have. However, videos that go viral are not always helpful to companies or individuals as we learned with the Dominos pizza case study. While the video is very unique and interesting to watch, the main reason for making it seems to gain mass attention and go viral. The main driving forces for undergoing such a task could have been simply to promote biking and an active lifestyle or for artistic reasons/appeal. Either way it was a successful attempt at creating an attention grabbing production and put together fairly well considering how much video must have been shot. At first I thought it might have been to help gain further attention for the green movement but the creative aspects and some of his actions (littering) seem to go against that. This video and the one that Lauren shared are full of creativity. I agree that the first one tried to have a high number of views, but what i remember from that video is that this guy use Apple products. There is no other real objective for this video, and I think it is maybe something that is missing here. I wonder if this guy was paid to use Apple products or “Barilla” pasta. If yes, it is a good communication for those companies because they don’t advertise a lot and don’t hide the purpose of the video. On the other hand , if this guy wasn’t paid for that, he just lost a great opportunity. Do you think this video would have been as famous without those products? In this video it was difficult to figure out what the common theme was. I think there is a disconnect in communication when too much is going on where the important information that is supposed to be communicated gets lost. I feel that the number of views does not necessarily mean the video has importance or that it is entertaining, I think videos are made to meet the needs of the viewer. Sometimes I have tried to watch videos that people have recommended to me and just because I view it does not mean it was appealing to me. I think this video was made to go viral and not a video of any real importance. I’m not quite sure what the point or reason for the video was either. However, it does point out that any creative person can now easily share their work with the world, which wasn’t quite possible just 6 or 7 years ago. This idea goes along with all of the YouTubers who created their own YouTube channels and post weekly videos of themselves or other things. If they do it right, they end up gaining hundreds to millions of followers and essentially become famous all on their own. They don’t have to deal with TV networks or movie companies. Everything is on their terms. There have been a few who even have their own TV shows due to their self-earned internet fame. This creates a great opportunity for advertising, and in turn, the YouTubers end up earning enough income from the advertising where thy can support themselves solely from their YouTube channels.